Mark O'Connor has come a long way in Geelong. 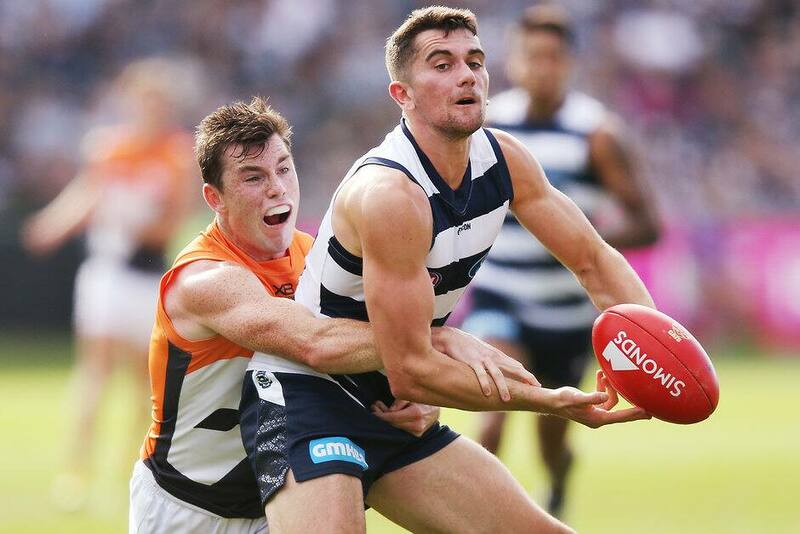 EMERGING Cats defender Mark O’Connor has recalled his baptism of fire in the world of Australian Football. The Irish export told the Geelong Advertiser he knew he was outside of his comfort zone after two particular incidents involving Matthew Scarlett and Harry Taylor. Scarlett set O’Connor on edge when the Irish Cat first took to the GMHBA Stadium turf for some skills training alongside coaches Scarlett and Paul Hood. Scarlett recounted his treatment of Gaelic footballer Dessie Dolan during an International Rules series as a means of introduction to the young Cat. “He (Dolan) was a pretty good Gaelic footballer back home,” O’Connor said. “(Scarlett) turned to me and said: ‘well, I broke his nose’. O’Connor’s first training session was just as unnerving, with the Kerry product on the receiving end of a trademark Harry Taylor hit. “I remember my first training session and I got the footy — there’s more time in Gaelic footy with the ball — and I held it for a second too long and Harry Taylor came in from the blindside and steamrolled me. It was a rude awakening,” O’Connor said. “But I was trying to find my feet, improve as quick as possible and trying to impress. Despite the tough initiation, O’Connor has stuck around and found his feet in Geelong. The club had a unique feel to it. “There was something special when I came down to Geelong,” O’Connor said. “I remember the drive, Kevin Sheehan drove me down. I met some of the people at the club and I knew there was something very special about the place. Despite a strong ‘tribal’ connection to his Gaelic club back home, O’Connor realised Geelong offered an opportunity he couldn’t find elsewhere. Battling through injury concerns, O’Connor knew a move to Australia could set him back on the right track to health. “I saw the facilities and how things work over here with the structure and lifestyle. I recognised I could be far better physically and learn so much more about my body,” he said. “I hadn’t kicked a footy much at all. It was unknown territory for me,” he said. O’Connor has now played in the Cats’ last eight games, playing in all encounters to start the year after finishing last season with four consecutive matches including the elimination final loss to Melbourne. The Irish Cat looks to be growing in confidence as he finds his place amongst the tight-knit Geelong defence known as the Misfits. He now rallies behind the man who set him on edge as he came to the club. “We’re all very close, the Misfits,” O’Connor said.